The D & O Plan will enhance the Regional Landfill's landfill gas collection system, which provides feedstock for the on-site landfill-gas-to-energy facility. 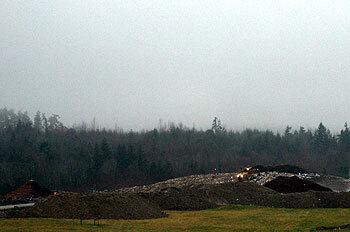 In 2007, the RDN initiated a Design and Operations (D & O) Plan for the Regional Landfill located on Cedar Road in south Nanaimo. The plan integrates the long-term development of this engineered sanitary landfill and infrastructure improvements with progressive closure of the site as a nature park amenity. The D & O Plan ensures that the Regional Landfill's design and operations minimize potential impacts on human health, the environment, and adjacent properties and their residents. 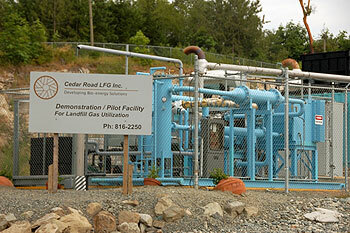 These include surface and ground water protection and monitoring and landfill gas management. The Regional Board approved the draft D & O Plan in 2009 following a positive response to consultations with households adjacent to the landfill and it received BC Ministry of Environment approval in August 2010. Forecast capital requirements for landfilling stages and infrastructure projects over a 20-year lifespan. Fill was added to Cell One to re-grade its slopes. In 2004, the RDN consulted with adjacent residents and property owners on long-range planning for the Regional Landfill and future closure options for the facility. The resulting post-closure implementation plan reflected the site's preferred use as a nature park amenity. Development of the nature park will be implemented in three phases. The first two phases will be sited on the Cell One unlined portion of the landfill, which was closed in 1996. In 2006, hydrogeological studies were conducted in support of development of the nature park. The ground and surface water studies identified excess leachate being generated due to settling of waste in Cell One and possible bedrock conduits for leachate migration. Correcting these issues required infilling, re-grading and re-contouring Cell One to improve surface water runoff and reduce leachate generation. Cell One area leachate and stormwater collection improvements were completed in 2009. Fill was added to Cell One in 2010 to re-grade the slopes of the area that will comprise the first phase of the nature park. During the summer of 2011 this area will be reclosed with a cover system incorporating a polyethylene liner. 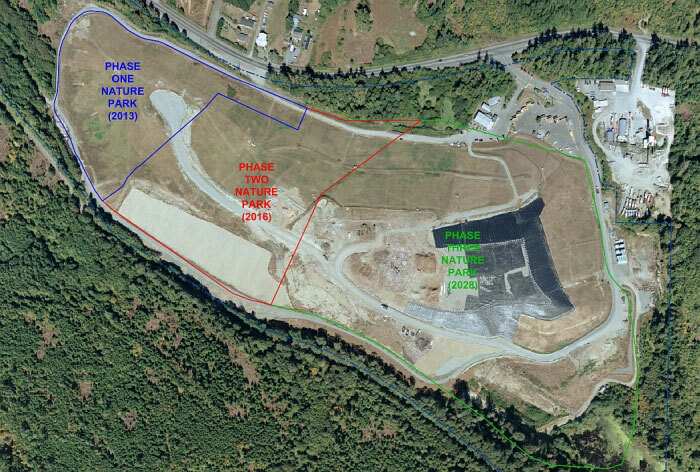 The D & O Plan has prepared a multi-stage fill plan that provides estimates of the total capital costs for development and final closure of the Regional Landfill, including construction of the nature park concept. The costs of landfilling stages and infrastructure projects over a 20-year lifespan are estimated to be $36 million. Funding for these projects will be sustained through tipping fees (landfill disposal charges) with no impact on property taxes. The nature park developed on the closed Cell One area of the Regional Landfill will be the first of its kind on a working landfill in BC. Project construction on the Phase 1 Nature Park, comprising a 3-hectare site, is scheduled to begin in spring 2012 with public access planned for spring 2013. The Phase 2 nature park will be sited on the remaining 6-hectare section of Cell One and is expected to be completed in 2016. Parking and public access points. After final closure of Cell Two (the lined portion of the landfill) a Phase 3 nature park will be added to the site. Cell Two is anticipated to close in 2026 and future waste disposal options for the region will be determined through the development of an updated Solid Waste Management Plan.